Long-distance movers like Mayflower aim to make your move as stress-free as possible by handling the logistics from start to finish. To see our top picks for the best long-distance movers, click below to read out guide. Mayflower is a full-service, long-distance moving company. Whether you are moving across state lines or the country, Mayflower provides services to help you each step of the way. From packing to unpacking, storing and transporting your belongings, and even house cleaning and trash removal, Mayflower offers packages to take care of each part of your move. Mayflower Moving offers a wide range of services for both residential and commercial customers. Since 1927, the company has been moving households and relocating corporate offices from coast to coast. Mayflower also has automobile transportation services with a specialized fleet of car carrier units. Mayflower is an approved General Service Administration carrier for assisting military families with moves. For household moves, Mayflower offers in-transit, or temporary, storage options if you aren’t prepared to move all belongings to the new location at once, or you need extra storage space before you move. You can customize your move by selecting from multiple moving packages with service add-ons and additional insurance protection. Packages include customized packing and unpacking, increased insurance coverage to protect your belongings, maid service for move-in or move-out cleaning, and trash and debris removal. Mayflower also partners with CityPointe Real Estate Services to assist customers with buying and selling their homes. When you decide to move with Mayflower, you will be assigned a moving coordinator who will help you choose the moving services that fit your needs, answer your questions, and guide you throughout the entire process. Mayflower has been in business for more than 90 years, and according to the US Department of Transportation, is one of the largest moving companies in the country. They stand out from other long-distance movers by providing complete, start-to-finish moving solutions. Mayflower has been in business for more than 90 years and is one of the largest moving companies in the country. They stand out from other long-distance movers by providing complete, start-to-finish moving solutions. Mayflower pledges to help you plan your long-distance move, transport your belongings, and support you all along the way. In the event your new home isn’t ready to occupy at the time of your move, Mayflower offers full-service in-transit storage options. Or, if you need extra storage space while selling your current home, Mayflower can store your belongings at a secure facility. Mayflower’s add-on packages allow you to bundle services to save on extras you may need. Six packages ranging in price from $195 to $1,395 give you extra insurance coverage and additional convenience services like debris pickup, move-in or move-out cleaning, computer and network disassembly, and home theater setup, for example. It’s important to keep in mind that Mayflower uses a network of third-party providers to perform these convenience services and does not provide most of these services themselves. Ask about all contractors to be involved with your move to ensure that you are happy with the selection. As an approved General Service Administration carrier Mayflower can assist military families and government workers with temporary duty or PCS moves. Additionally, Mayflower has been providing corporate relocation services for more than 75 years, as well as automobile transportation services. You can include vehicles in your moving package, or Mayflower can put together a vehicle-only moving contract. Because each moving scenario varies, it’s impossible to predict actual costs. The price of your move will depend on the services selected, the distance to your new location, the number and weight of your items, and your moving date. The most expensive months to move are during peak moving season, which is May through September with June typically being the busiest month. You’ll save money if you relocate during December, January, or February. Also, weekday moves usually cost less than weekends. To obtain an estimate of your costs, see Mayflower’s website or call their customer service number. Phone representatives are available Monday through Friday from 7 a.m. until 9 p.m. and weekends from 9 a.m to 6 p.m., CST. Here’s a snapshot of the average cost of a move based on the type of home you have, the total weight of your household items and the distance of your move. Booking a move will involve speaking with an agent, either over the phone or in person. You will need to know your moving dates, destination and have your contact information ready. Use the In-Home Estimate form on Mayflower’s website and an agent will call to arrange a visit to see what will need to be transported on their trucks. This visit is a necessary step in the process because customers can forget to include items in an estimate. Alternatively, you can call Mayflower’s customer care center to schedule your in-home estimate. During the in-home estimate, a salesperson will come to your home to review all belongings to be moved and to estimate their weight and size. The representative will also discuss your moving dates, any additional services you might need such as packing, and answer your questions. At the end of your meeting, the salesperson will hand you a written estimate for you to review. If you decide to have Mayflower take care of your move, you then work with a move coordinator for help with determining which moving services you’ll need and to get answers your questions throughout the entire moving process. Mayflower receives above-average scores in independent consumer research. 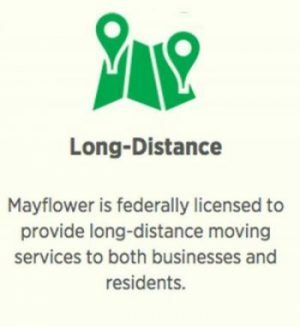 As a full-service, cross-country mover, Mayflower contracts with nearly 300 local agents. At times, a customer’s experience with the company depends significantly on the service of those local agents. When consulting with Mayflower regarding your move, it’s critical to research all the way to the local level to confirm the reputation and rating of the local moving agent(s). The US Department of Transportation lists six complaints against Mayflower from 2015 through the first quarter of 2018, however, given the size of the company and the number of moves each year, the number of complaints is below average. Does Mayflower make local moves? While Mayflower does not provide local moving services, the company can refer you to local movers through its network of more than 250 agents. How does a long-distance move differ from a local move? Unlike local or short-distance moves and moves that occur within the same state, long-distance moves involve more regulations because cargo crosses state lines. Special authority from federal regulators is required to transfer customers’ belongings from one state to another. Long-distance van lines are also required by law to carry specific insurance policies designed to protect customers and their belongings. Is an in-home estimate required? Federal Motor Carrier Safety Administration regulations require an in-home estimate for a long-distance move. A reputable moving company will comply with this guideline. Beware of companies that only provide over the phone estimates. An in-home meeting will ensure accurate pricing from the beginning. Be sure to show your in-home representative all items you wish to have moved. Don’t forget the attic, basement, and any belongings you have in storage. What items are not allowed on the moving van? For the safety of your family, your movers, your belongings, and everyone on the road, not everything can be packed on the moving truck. Perishable items, chemicals, batteries, paints, and many other things are hazardous. If you are in doubt about whether or not to pack an item, check with your Mayflower agent or move coordinator for a full list of things you can pack. 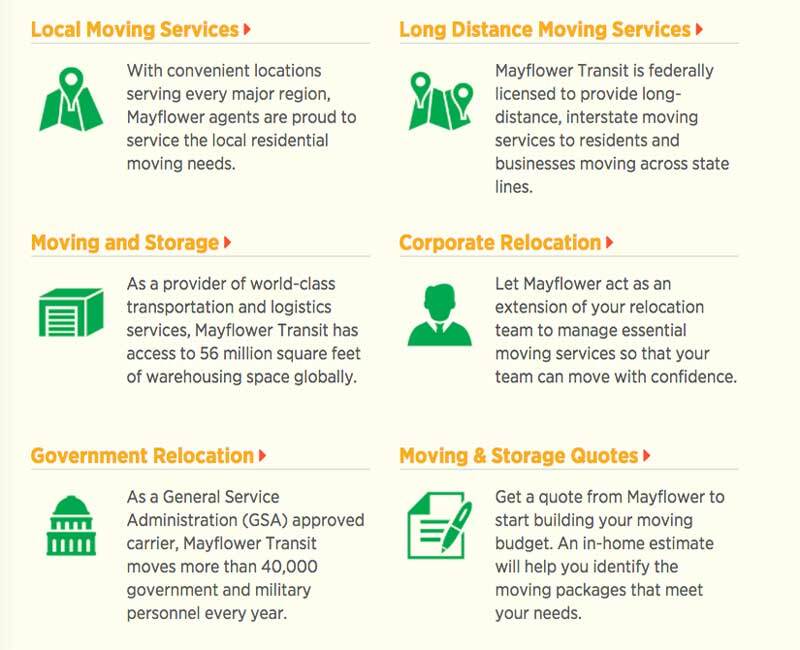 How does Mayflower help me plan my long-distance move? Mayflower’s promise to make your move as painless and straightforward as possible includes a wealth of articles, tips, and planning advice on their website. Their moving planner checklists take you week by week, starting eight weeks before you move, through what you need to pack and prepare with ease. Also, your move coordinator will serve as a point of contact to answer any questions you may have along the way. Tackling a long-distance move is one of the most stressful processes you will face. You will want to choose a moving company that can ease your burden and that guides you securely to your new destination. Mayflower has two definitive advantages: decades of experience moving households across the country and a full range of moving solutions. This is definitely a terrible experience. Both Mayflower and the local mover charged my card, and none of them want to be responsible for their damage to my shipment. They always tell me "the other part is wrong and should be responsible for this, call the company". So far, neither got my money back nor the damage took care of. I guess it is a big mistake to go to Mayflower, as it is responsible for nothing except charge the credit cards. I should just contract with a local mover then they have no excuse to dodge problems.